Does that not look ridiculously, over-the-top, drool-running-down-your-face amazing?! It’s so incredible that it’s obvious I didn’t make it. I have an awesome guest post today from my friend, Vane, of sweet-lab. This girl is crazy talented in the kitchen, baking up amazing treats like these chocolate caramel soft pretzels and hazelnut cheesecake. Vane is also a true artist when it comes to photography. You have to check out her site for all the gorgessity. I’m excited because we’re going to be meeting at the International Food Blogger’s Conference in Seattle in September. Until then, I’ll continue to stalk her and drool over her delicious recipes on her blog. Heeeeeeeeeeeere’s Vane! I’m extremely delighted and excited to have the opportunity to be guest posting on one of my favorite blogs today. Thank you once more Nancy for inviting me over and filling your readers’ lives with such great stories and recipes. But before I begin, please allow me to introduce myself. My name is Vanessa and I bake for a dessert blog called sweet-lab. A first kiss? Yeah, that was completely nerve-racking for me to say the least and not so special after all. Thank God there is only one “first kiss” in the history of kisses. I’m guessing that I wasn’t ready for it, but who is ever ready for their first kiss? Lucky you if you were. And your first day back to school after a long summer? Yeah, well…can I just please roll back into bed forever and ever and ever? Okay thanks. Oh and that first job interview that happened so long ago…I can’t be the only one who felt like puking all over the interviewer’s desk when asked about my goals, strengths, weaknesses, or how I handle pressure. How I handle pressure? You’re about to find out pretty soon for yourself sir. What about your first day at your new office job? Well, I’m sorry Mr. Boss Guy. I’m a bit too nervous and shaky to remember where you’re telling me to keep client files. For that reason, I’m carrying a brand new notepad with me and writing every single word that comes out of your mouth. Like literally, every single word. I mean, I even wrote down directions of how to get to the nearest restroom because….well, we all know that’s crucially important, right? And I should’ve probably written down your full name as well, so that I refrain from calling you Mr. Boss Guy when I greet you “Good morning” tomorrow. Oh well, I’ll figure it out. But scratch all of that! More than anything, I’m filled with complete happiness and excitement to be here today and to have the opportunity to share this recipe with you. 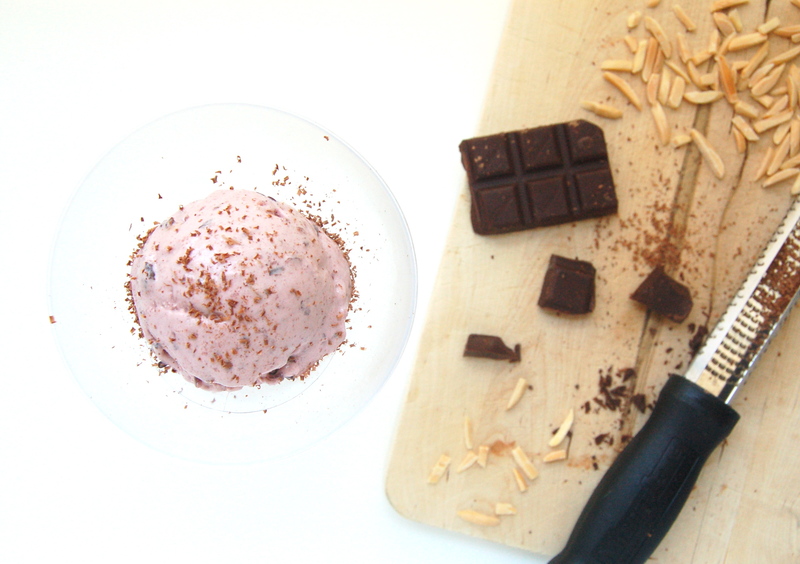 It’s cherry almond stracciatella ice cream, which consists of seasonal cherries paired with toasted almonds and shavings of dark chocolate. Oh, what was that? You said you have never had this ice cream flavor before? Well there’s a first time for everything, isn’t there? 1. Stem the cherries and remove their pits. 2. Combine cherries, water, freshly squeezed lemon juice, and 3 oz of sugar in a large saucepan. Cook over low-medium heat for approximately 15-20 minutes, stirring occasionally until cherries soften and become cooked through. Remove from heat and allow them to reach room temperature. 3. Purée cooked cherries along with their liquid in a blender. Add a little bit of the milk quantity into the blender in order for the cherries to become puréed more easily. Purée mixture until it is smooth. Set aside for later use. (Note: Add just enough milk so that cherries begin to purée and move freely in the blender, about 2/3 C of milk. If you don’t add a small quantity of milk, cherries may become stuck at the bottom and not purée). 4. Add cream and reaming milk to a saucepan and bring to a gentle simmer. 5. Meanwhile, whisk egg yolks and sugar in a large bowl. When milk and cream have come to a simmer, slowly temper egg yolks by pouring milk/cream mixture over egg yolks/sugar mixture while whisking simultaneously. Pour mixture back into a small saucepan and cook on a low and gentle heat so that eggs don’t become scrambled. Stir mixture in a figure 8 pattern with a wooden spoon so that all sides of the saucepan are touched as you cook it. Continue stirring until mixture naps the back of spoon. That occurs when the sauce is thick enough to leave a path on back of spoon when finger is drawn across. At this point you have made a sauce called a crème anglaise. 6. Pass crème anglaise through a sieve and it into a large bowl. Add cherry purée and almond extract to crème anglaise and stir to combine well. Refrigerate for about 2 hours, until sauce is cold all throughout. 7. Remove sauce from refrigerator and pour into ice cream machine bowl. Make ice cream according to the manufacturer’s instructions. 8. 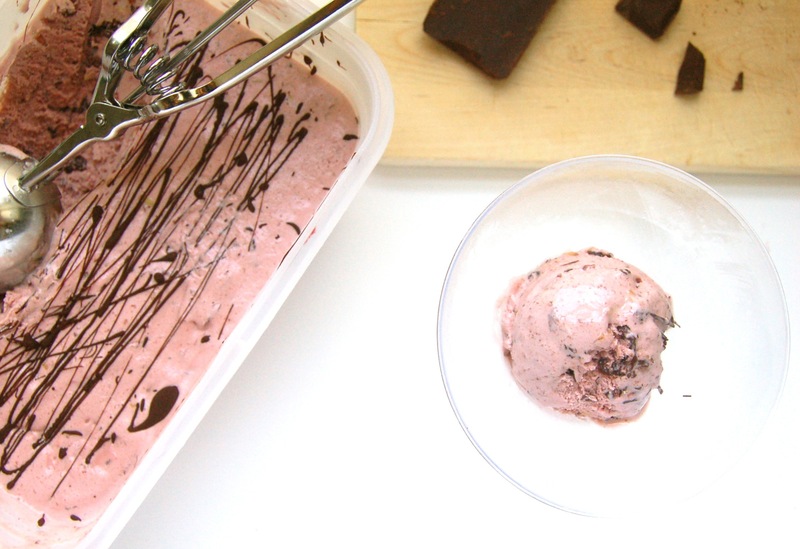 While ice cream freezes, melt chocolate in a metal bowl that is set over a saucepan of barely simmering water. Stir chocolate frequently. Once ice cream has finished churning, pour all but 1 tablespoon of melted chocolate in a slow stream directly onto ice cream as it churns. Continue to churn 30 seconds as chocolate hardens in streaks. Break up chocolate streaks into smaller pieces with spatula if needed. 9. 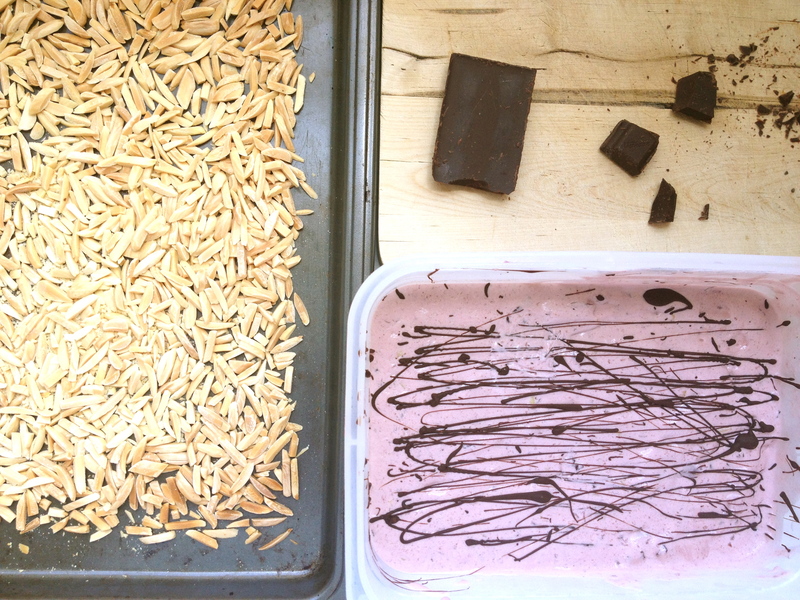 Turn ice cream machine off and fold toasted and chopped almonds into ice cream with a spatula. 10. Transfer ice cream to an airtight container. Drizzle remaining 1 tablespoon of melted chocolate over ice cream in long zigzag lines. Cover and freeze for a minimum of 3-4 hours. (Optional: Grate dark chocolate over ice cream when serving it). Good Gawd, Vane seriously delivered with her guest post today. I can’t get over how gorgeous these photos are and how creative and unique this ice cream is. 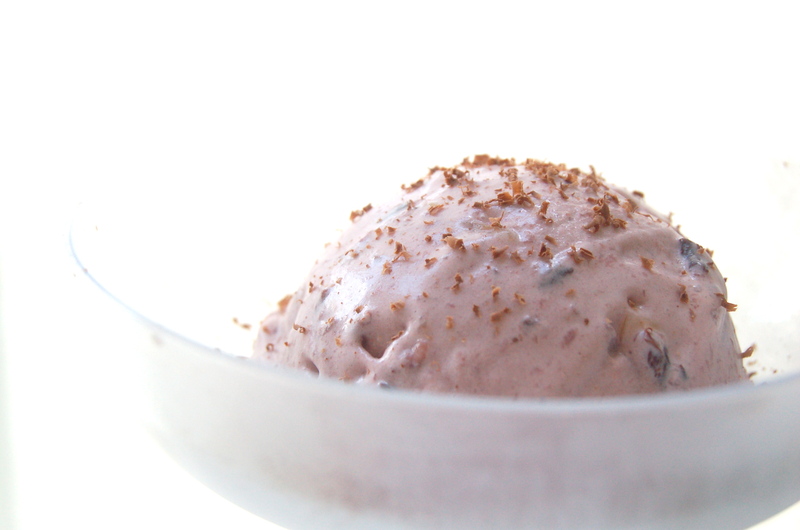 I can’t wait to make it and gorge myself on luscious, creamy, delicious cherry almond stracciatella ice cream. Thanks, girl, from my tastebuds and wasteline! This looks AMAZING!! And sounds so fancy–I adored the straciatella gelato I ate by the pound in Italy and this totally reminds me of that (except way fruitier, obviously!). Cherries and almonds are such a fabulous combination and these are totally drool-worthy photos. Great guest post–I’m so jealous you guys will be able to meet up in September!! This is an awesome guest post, both of you! 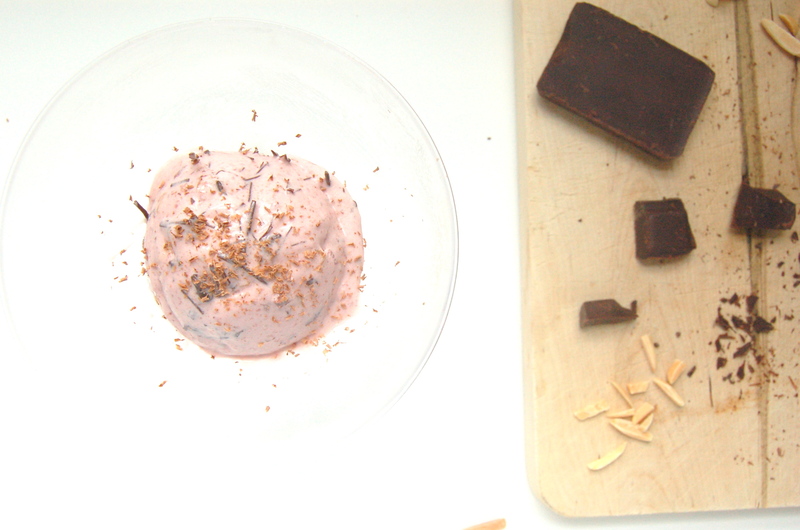 We here eat every ice cream flavor with added chocolate shavings or shards, and they´re the best. 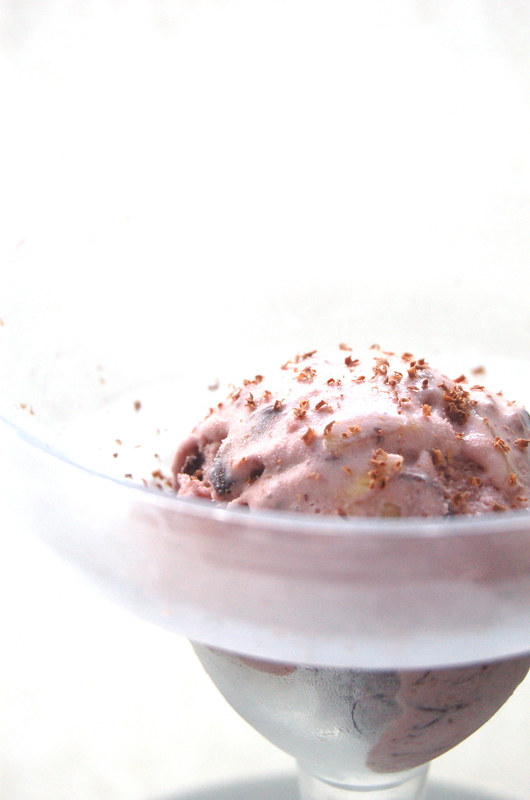 But, interestingly enough, cherry cream which is very popular, is not paired with chocolate from what I know. How weird are we?! Anyway, this is a fabulous recipe and thanks Nancy for this blogger introduction! Paula, I can’t wait to visit Argentina in the near future and eat ice cream along with all the delicious goodness that comes from that country. I can say that the chocolate added to the cherry and almond flavors was a nice touch and I encourage you to try it! ah love this post! and Nancy, thank you for introducing me to Vane’s lovely blog! 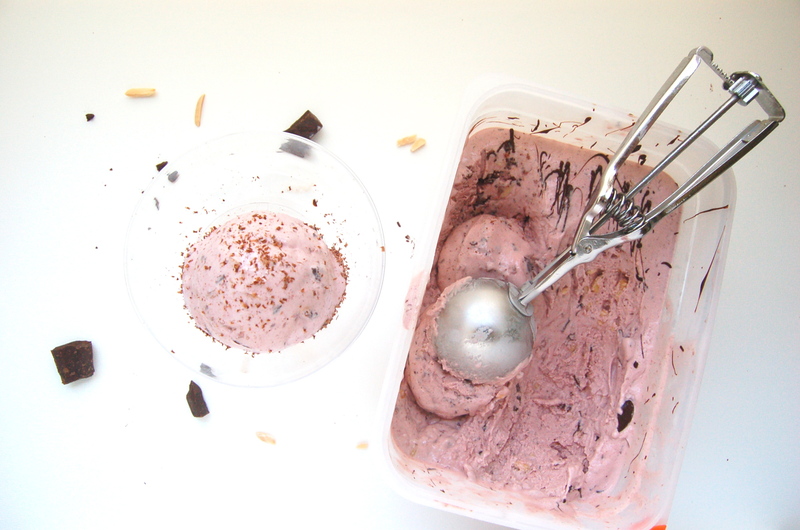 I love everything about this Cherry Almond Stracciatella Ice Cream. . and now I have an ice cream maker. . totally going to try this. . looks just gorgeous. . so I’m left with thinking about my first kiss and this ice cream today. . not bad for a Friday! 🙂 loved this post!! and hope to meet you too in Seattle at IFBC! This looks waaay better than any ice cream from the store! Congrats on your first guest post! I haven’t had my first kiss yet, but I definitely remember that first day back to school feeling – even if I’d like to forget it. Straciatella has been in my mind for days and I’m glad I get a chance to meet Vane here. Now that I have the recipe in hand, I know I need to start shopping for this. Very nice to meet you as well Linda! Thank you. I’m very glad Nancy and I got to know each other via the internet and in September we will be meeting each other in person. After reading her blog, I think Nancy and I share a lot of things in common and I’m very excited to meet her! And straciatella anything is my baby this looks absolutely utterly delicious! What a brilliant guest post! Oh my foodness! This looks amazing. AND my ice cream maker is ready to go! I just want to dig right in! Perfect! Looks insane, absolutely insane! Such a pretty pink, with the chocolate streaks and gorgeous photos!! your landlord be sure that to say part 93a of the patron protection act.